When visiting historic churches, I always have a wander around the cemetery, looking at inscriptions old and new. I often wonder what this person was like, or how that person lived their life. Occasionally, the inscription gives a tantalising clue to an interesting story, which I will sometimes try to follow up later. On a recent trip to the St Fagan’s outdoor museum in south Wales I had a look around the village churchyard. Towards the back was a Commonwealth War Grave stone on the grave of John Heritage, who died in 1982. I assumed he was in the Falkland War. Once home I looked up his somewhat unusual name, to find that he was actually killed in the IRA bombing of the Royal Green Jackets military band in Regent’s Park, London. A more puzzling grave can be found hidden behind St. Tysilio’s church on Church Island in Menai Bridge. 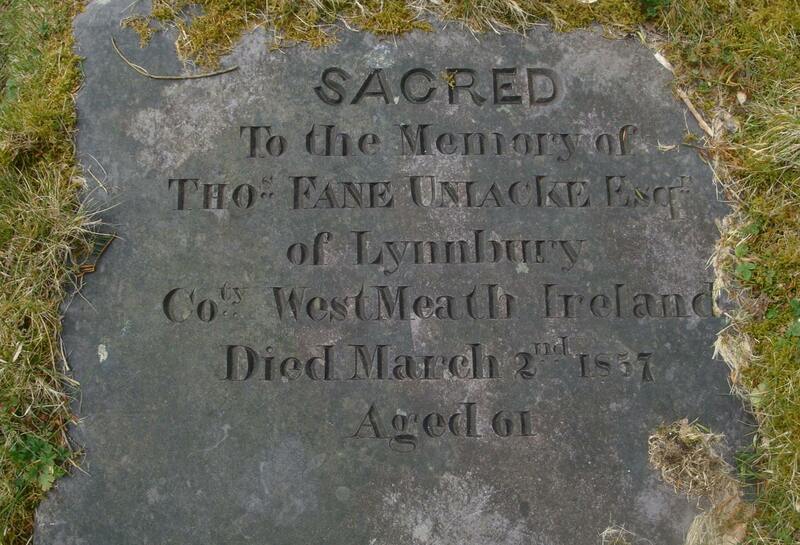 I spend a lot of time in Ireland, so I stopped in my tracks when I spotted the grave of Thomas Fane Uniacke “of Lynnbury, Co. Westmeath, Ireland”. How did someone who lived in Ireland wind up buried in Menai Bridge? He was also blessed with a rather unusual name, which made tracking down information about him relatively easy. I first turned to Ancestry.co.uk, where I found several family trees that have him listed. Most of them gave the same death date as on this grave, March 2 1857, but there seems to be uncertainty about the circumstances of his death, as two different death places are given. Some say he died in Co. Cork, Ireland, whereas others say he died in Rifle Township in North Dakota, USA. Many give no death place at all. None say anything about Menai Bridge or Anglesey. I contacted some of the people who had posted these family trees, but none was able to tell me much about him, other than the basic facts in the trees. He was a side branch of all their families, rather than a direct ancestor. The basic facts are these: Thomas Fane Uniacke was born in 1792, son of Redmond Uniacke Esq. and Elizabeth Fleming, of Carrig, Co. Cork. He and his family are listed in Burke’s Landed Gentry Of Ireland, and were prominent landowners with their seat at Mount Uniacke, near Youghal, Co. Cork. His grandfather, James FitzGerald Uniacke, was a commander in the Battle of the Boyne in 1690, who apparently gave up his horse to King William when the king’s horse was shot in the battle. The family is full of military men, and Thomas was an officer in the Rifle Brigade. His two brothers were also military men, with Capt. John Uniacke being killed in the Siege of Ciudad Rodrigo, Spain, in 1812, and his four sisters all married officers. His two sons were officers in the Highland Light Infantry and his daughter married an officer. Thomas somehow made the move from Cork to Co. Westmeath, perhaps through an arranged marriage to Elizabeth Rochfort, daughter of Gustavus H. Rochfort, Esq, M.P. for Westmeath and grandson of the first Earl of Belvedere. Thomas owned land in the county and was a land agent and a magistrate. His name crops up regularly in newspapers related to court cases and other legal matters, and even as a steward at the races in Mullingar. The last record I find of Thomas Uniacke himself before his death is related to a court case in 1853. What happened to him after that, and why did he wind up dying in Menai Bridge? One clue is the death notice of his wife Elizabeth, just a year before his own death. Curiously, she died at Glenavon, Haverfordwest, in South Wales. Did they have some connection to Wales? Their daughter Frances, who married Capt. Seton Lionel Smith, settled in Laugharne, about 25 miles from Haverfordwest, after he retired from active military service, probably sometime in the 1850s-1860s. Perhaps Elizabeth had been travelling to visit her when she took ill? Perhaps her husband had also been travelling there a year later when he died? It’s still a mystery, but I’m still looking for clues. See more Anglesey books on our book page.